Ballet is the basic foundation of all dance forms. It teaches proper placement, carriage, grace, and poise. Barre exercises develop strength and flexibility, while center work allows the student to practice classic dance principles. Ballet is highly recommended as a complement to other classes because the terminology and placement learned in ballet quickens advancement in other classes. Hip Hop is the latest in popular street and video moves put into combinations that are fun and exciting! All music is age appropriate with edited lyrics! Jazz dance is an American dance form which evolves and changes with the latest popular styles. Students work on placement and technique while learning modern, funky, and contemporary jazz styles. The class consists of a warm-up, floor progressions, and combinations. This is our triple threat class. Children will learn to sing, dance and act. Drawing inspiration from many Broadway productions. Tap class combines dance with rhythmic foot patterns. Students learn coordination of feet and musical rhythms in a way that is both challenging and fun. This is a creative movement class designed for the 2-3 year olds. We use animal improvisation, musical stretching, jumping exercises, and other techniques to have fun while learning the physical and social fundamentals of dance. Tumbling is the mat portion of gymnastics. Mats are used to teach students safe techniques for rolls, handstands, walk-over, handsprings, and other tricks. Studying tumbling in a dance environment assures students have equal ability on both sides, and the focus is on beautiful technique. Tumbling is a great complement to any dance form. This is a class specially designed for pre-schoolers ages 3-4! The children will learn basic dance skills and terminology through fun activities and "games". These classes are a combination of different subjects all in one class. 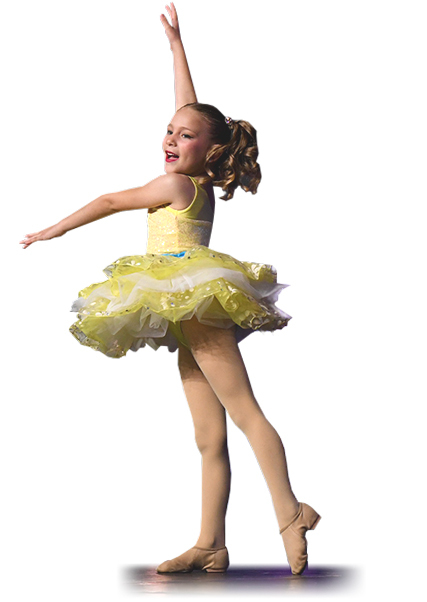 We rotate between all the styles each week to include: ballet, jazz, tap, tumbling, hip hop, and contemporary. This allows the student to experience "a little bit of everything."